Kammler worked in the Reich Aeronautical Ministry until the end of 1941. He joined the Allgemeine-SS in 1938, transferring to the SS Economic Administration Department in the autumn of 1941. He was appointed chief of Amtsgruppe C, overseeing the Reich’s building and construction industry, as well as that the SS. Under his leadership the SS-Baustaebe was created, which employed thousands of concentration camp prisoners as builders between 1943 and 1944, on military projects such as the Atlantic Wall, as well as in clearance operations in bombed-out German towns and cities. He may have been in charge of the construction of the gas chambers at Auschwitz, although this has never been proved. The officer entrusted with running the V-weapons project from its inception. 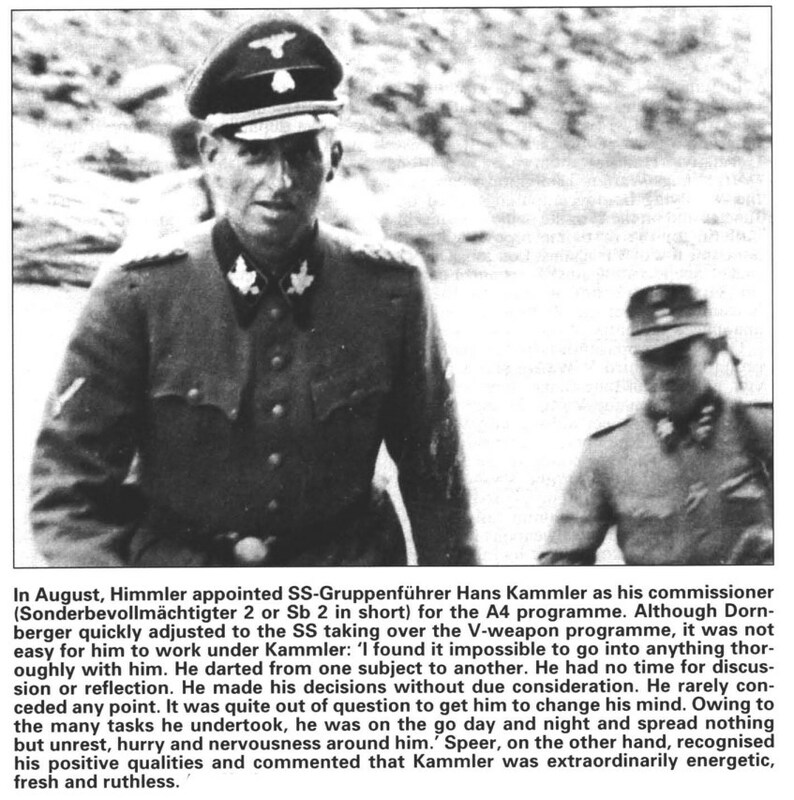 Probably the most extraordinary and enigmatic figure among the latter-day Nazi hierarchy, SS-General Dr (Ing) Hans Kammler (b. Stettin 26.8.1901) was a grey career man who had seen no fighting at the front. As engineer in charge of Building and Construction Works at WVHA, the SS-Chief Economic and Administrative Office, in 1942 Kammler had had responsibility for the planning and design of a number of death camps and had personally supervised the construction of the Auschwitz satellite camp at Birkenau. On 17 August a large force of British aircraft bombed Peenemünde. The material damage was not extensive and more than 80 per cent of the bombs fell on open land and in the nearby woods. Even the effective patterns had damaged mostly non-industrial or easily repairable facilities. Dornberger reviewed the damage at first light and concluded that the site would be operational again within six weeks, but the following day Kaltenbrunner, head of SS Security Police, arrived in order to enquire personally into an alleged security leak. The intervention provided Himmler with the opportunity to approach Hitler with a convincing argument for transferring the entire V-weapons project from the Army to the SS. The satisfactory continuation of the programme could be guaranteed only by placing it under SS supervision, he argued, ensuring secrecy by using concentration camp inmates for the work force. Hitler concurred. On 1 September 1943 Hans Kammler was promoted to SS-Gruppenführer and appointed Special Commissioner for the V-2 project. He recruited 2000 engineers and drew 15,000 concentration camp inmates from Buchenwald and Natzweiler3 for the conversion work at the former Wifo factory now renamed Nordhausen Central Works and also SS-Mittelwerk, the latter by reason of its geographical position at the centre of Germany. During the first week of March 1944 Kammler was given overall responsibility for Underground Constructions and now had 175,000 concentration camp inmates under his control. An SS Special Staff known as Baubüro Dr Hans Kammler became directly answerable to Himmler not only for the production, completion, storage and supply of V-weapon armaments but also for building a number of massive underground weapons factories the size of a small metropolis such as Quarz at Melk, Austria, and Zement I and II at Ebensee. On 8 August 1944 Himmler appointed Kammler as General Plenipotentiary for V-2 Assembly and C-in-C V-2 Operations, which had previously been under the jurisdiction of LXV Army Corps. His Lehr-und Versuchsbatterie 444 got off to an inauspicious start when the first two V-2 rockets of the campaign aimed at Paris on 6 September both failed through fuel blockage. After shifting location but with the same target, a successful launch was achieved on 8 September. The same day Artillery Detachment 485 obtained a hit at Chiswick, London, from the Hague. From August 1944 until the conclusion of the Ardennes Offensive, in addition to the V-1 and V-2, Kammler oversaw the operational deployment of the V-3 High Pressure Pump and was present to observe the first rounds being fired on Luxemburg City on 30 December 1944. On 26 January 1945 Kammler was made commanding general of the 5th Flak Division at Rotterdam, a very remarkable appointment for a man with no battle experience, and on 14 February he took over Army Korps zbV (zbV = for special purposes). On 31 January he came straight from the V-3 installation at Lampaden to organize the placing of two detachments of his Division’s flak on the eastern banks of the Rhine. All this was satisfactorily accomplished by late February and in early March Kammler was confirmed as General Plenipotentiary to Halt the Terror Bombing. This meant that he was now responsible to the Führer directly for all anti-aircraft measures, which would have included the supremely secret versions, as well as the conventional anti-aircraft rockets produced at Peenemünde, Wasserfall, Hs 117 Schmetterling, Enzian, Taifun and the remote-controlled Hs 298 and X-4 Ruhrstahl. It appears that he had had powers as plenipotentiary before his appointment, since on 6 February 1945 he had signed the order to discontinue work on Schmetterling and Enzian. In either February or March 1945, or at any rate by the time Kammler had achieved the rank of SS-Obergruppenführer and General der SS, he was given complete jurisdiction for the turbo-jet fighter. Another objective which does not seem so well-documented involved transferring Dr Dornberger and his work staff in February of that year from Schwedt on the Oder to Bad Sachsa where Dornerberger was to be responsible for the development and testing of “anti-aircraft measures” and for that purpose was to set up “Development Team Mittelbau” under Dr Alfred Buch, a scientist. Kammler ordered a large number of firms to be co-opted to concentrate on “special equipment”. At the beginning of April 1945, for the defence of the central Harz, Kammler cobbled together an infantry corps from retreating Army units and V-1/V-2 firing commandos. He also made a determined attempt to swell SS numbers at Niedersachswerfen by recruiting Mittelwerk technicians and engineers but this does not seem to have been too successful. In any case, 500 or so of these personnel, the major part of the former Peenemünde team, had been ordered by Kammler to relocate in the Garmisch-Partenkirchen area of southern Germany, and most of them made the six-day journey by the special train sardonically known as the “Vergeltungs-Express”. Dr Wernher von Braun was told by Kammler that he, Kammler, had been made Head of the Fighter Plane Staff and “had to report to another place”. On 7 April 1945 Kammler was seen leaving Mittelwerk towards the western Harz with a section of his General Staff and, apart from a cable to Himmler, sent from a village called Deggendorf, confirming his continuing loyalty to Hitler ten days later, that was the last heard of any of them. Kammler knew virtually everything about the V-Weapons operational programme. His whereabouts after early April 1945 are unknown. There are reports of his death in action defending the Czech Front against the Soviet Army, and the latter gave short shrift to captured SS men. A recent book by Nick Cook proposes that Kammler negotiated a deal for himself with the United States in exchange for Germany’s anti-gravity technology. What evidence there is suggests that this was not the case. Bormann’s 1944 General Plan of Evacuation was drawn up to safeguard the more advanced technological knowledge by having people like Kammler brought out of Europe before the capitulation. One must not lose sight of the fact that at the end of the war there was a huge influx of Reich money and scientific personnel into Argentina and Chile, where deep below ground perhaps some of the more important work was continued. Mr Cook’s line of argument is based on the document circulated by the Polish author Igor Witkowski. This bulletin definitely states that the equipment at FHQ Waldenburg was evacuated in April and May 1945, probably to South America, by SS-Obergruppenführer Jakob Sporrenberg. It would be in South America that the designer-builder of Auschwitz and other death camps might have felt more comfortable for his own peace of mind than in relying on a deal with the United States. One would also think it safe to assume that if the USAF had been able to make head or tail of German antigravity, they would not have bothered with the same old rocket propulsion methods at Cape Kennedy three decades afterwards. This entry was posted in Biography, Germany, Weapons by MSW. Bookmark the permalink.